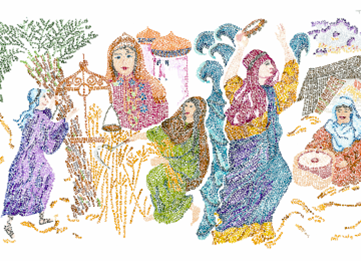 This stunning piece by, Ellen Miller Braun, combines the Book of Ruth with two very moving prayers: Eitz Chaim Hee - It is a Tree of Life and the Blessing of the Daughters given by some parents on Friday night, combined with the Blessing of the Eve of Yom Kippur (the Day of Atonement). These blessings are a beautiful gift to share with every woman, whatever her age. May you be so Blessed. Every woman is like a unique flower, having a distinctive color and individual scent. Together, all the flowers create one beautiful bouquet blossoming from the Tree of Life. A young girl - turning twelve - is a fresh bloom joining the garden bouquet of womanhood. According to Jewish tradition, twelve is when a girl reaches the age of accountability for the Torah and HaShem's Mitzvot (commandments). She begins her journey as a young woman. She begins walking the path of continuity, linking her and her family's past with that of her present and future and to all of Am Yisrael (the Jewish People). Ellen Miller Braun was born and educated in Chicago Illinois, U.S.A. She studied fine arts at Northeastern Illinois University. An ardent Zionist, Ellen immigrated to Israel with her husband and children in 1983. They live in Ginot Shomron, in the Biblical hills of Samaria. Ellen's traditionally observant Jewish background has guided and inspired her in the development of the Biblical themes of her artwork.